Home » Columns » The Connected Woman » So, What Makes You Different? In this incredible era of instant information, social media and incredible connectivity, it’s more important than ever to have our message stand out from the rest. There’s so much that consumers have become very adept at tuning it out. While repetition and consistency is important, it’s not enough. It’s that time of year – they’re everywhere. They’re like pop up ads on street intersections every weekend in our neighbourhoods: yard sale signs. Most of us don’t pay any attention to them but on my way home from a coaching session, one really stood out . . .
No fancy graphics, just big, bold letters. 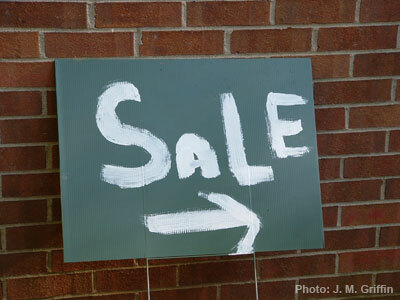 Yes, I’ll admit it – I do love garage sales but I don’t plan a map of all the addresses for a Saturday outing however, even though I was in a suit and heels, I followed the sign to see what a ‘cool dude’s stuff looked like. I drove by the house. It pretty much looked the same as the other yard sales I’ve been to; furniture, boxes of records (you remember those!) books, etc. with one exception: There were LOTS of people at this one. Parking was at a premium! OK, so what did they do to attract all these people? Simple – they stood out from the ‘noise’ of the other signs. They combined emotion and a bit of psychology 101. After all, who wouldn't want stuff that is "cool" and belonged to a “dude” as opposed to someone else’s junk that will get thrown away or donated to the Salvation Army if it doesn't sell? In this incredible era of instant information, social media and incredible connectivity, it’s more important than ever to have our message stand out from the rest. There’s so much ‘noise’ that consumers have become very adept at tuning it out. Fact: lots of companies sell exactly the same thing. Fact: some thrive while others go out of business. What's the difference? "What sets us apart from our competition is ________." "What makes us different from everyone else is _______." "What you get from us, that no one else offers is _______." It’s more profitable to be different!